The Islam Awareness Blog: Hamas rockets 'a war crime' ? According to an Al-Jazeera report, Rocket attacks carried out against Israel by Hamas and other Palestinian fighters amount to war crimes, according to a Human Rights Watch (HRW) report. 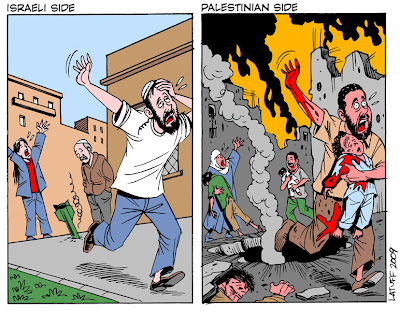 I think the cartoon above summarises the war crimes of Hamas and Israel. Read the complete report on Al-jazeera here.